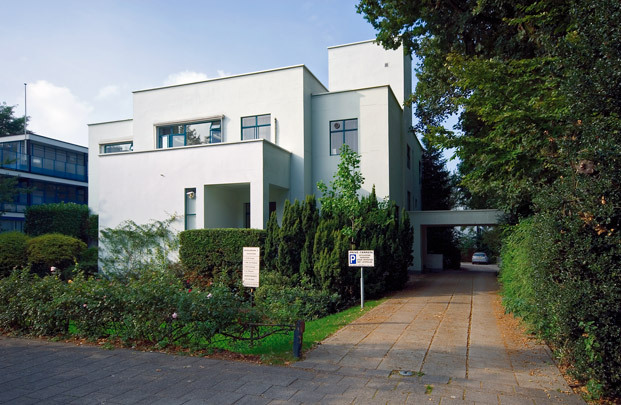 The first house on this former meadowland (Land van Hoboken) looks like a modernist white villa, but originally was entirely of brick out of deference to the nearby Boijmans Van Beuningen Museum. Symmetrically configured in cubic volumes, the villa was built for the jeweller Peter Merkes, bachelor and art collector, though he died in 1932 before it was completed. With its monumental hall, it was more like an art temple than a house. It served as a natural history museum from 1934 to 1959. Two years later it was radically recast as a doctor's practice; a loggia at the front was closed off and the facades white-rendered to stand it in good stead with its neighbours.